When you create a tracker in the Adjust system and want to integrate it with Adcash, then the tutorial below should help you out. In Adjust, please select "Adcash DSP" from the list. All entered static parameters must remain the same. When the URL is generated, it should already have "&install_callback=" variable generated in it. The postback used by Adjust and Adcash is just an example, you need to make sure that you use the postback code from Adcash DSP > Goals > "Tracking code". On https://partners.adjust.com/enter Adjust's tracker URL in the "Enter your links" box. Remove "&install_callback=" together with the value of this parameter. 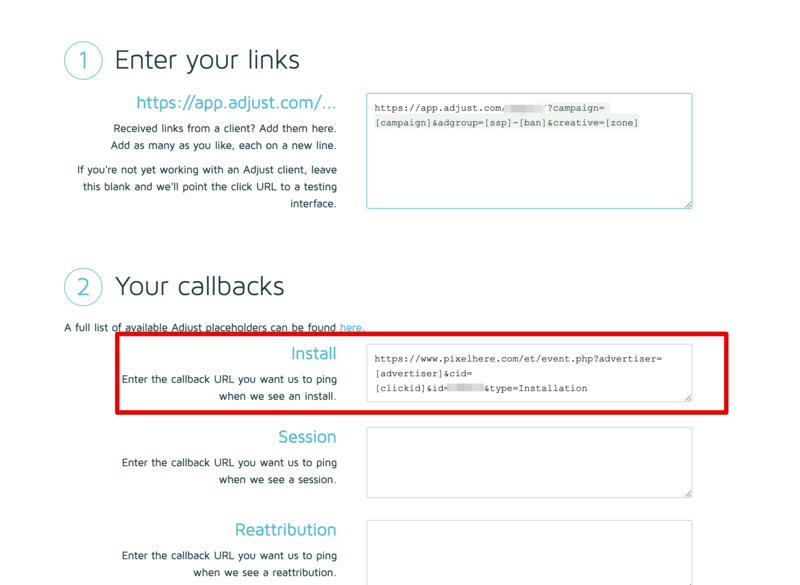 Copy the goal tracking code from the Adcash system and paste it into "Your callbacks" under the Install section. Make sure that [clickid] value is entered correctly. Go to the end of the page "Generated URLs", click on button "Copy URL". Use the generated URL as campaign creative URL in the Adcash DSP Panel.